While thrifting the other day I came across the awesome brass lamp. It weighs like 5 pound and has the most GORGEOUS shape!! I've been obsessed with getting it painted because I knew it would be A. Mazing! I was a little nervous about the paste/concrete-ish grey stuff (underneath the plastic part of the lamp). It must've been broken at some time, but it seemed very sturdy and I was not letting this one get away. By the way, I looked up the brand of the lamp- Artesanata made in Portugal. I couldn't find any info online but it doesn't feel cheap. Any info out there in Blogland? Hopefully I'm not painting a priceless antique! I used two coats of primer for metals and as really impressed with how well it adhered to the base. 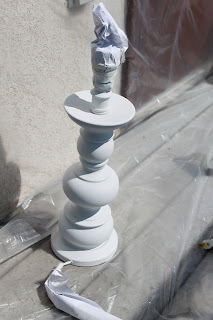 Then two more coats of spray paint- this time a can I found at Michaels' on sale for 59 cents! A real beaut from Z Gallerie. Here it is in it's new home. Let me know what you guys think! Update: Check out these fantastic blogs who liked my Lamp Redo! I think it looks great! Love that color! I love the color of your lamp! Either way you go on the shade will look good! Wow- it's so lovely! That color is fantastic- well done! Would love for you to come share at Feathered Nest Friday sometime! I think the shade on it looks great! Love it! Love the color you used! It is a beauty! I love it! I've been eyeing that lamp, but was not going to pay retail for it! That's awesome. I love it when you can find such a cheap knock-off. It looks AMAZING and so much like Z Gallerie! Great find! I love that lamp shade---I'd say keep it! Save yourself the hassle of finding another one! I'm your newest follower, I love the lamp! What a great colour choice! I'll be featuring your lamp on my blog at http://littlekatieontheprairie.blogspot.com this Thursday as one of my favorite things!! I hope you drop by and check it out! Great job again on the lamp. You are so creative! 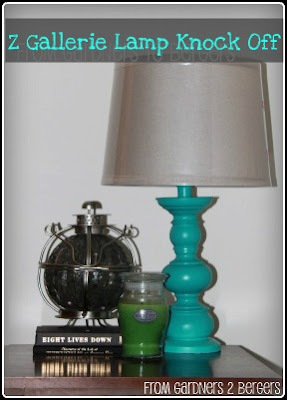 Super cute- love the shade of turquoise! 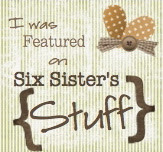 I just came across your blog and am loving it! Love! Such a cheerful color! Love this! I have been painting my room and have to change my lamps. This looks so easy I will definitely be trying it!!! That lamp is amazing! I love the color! I think that the shade looks great, but a white one might really make the color "pop" . . . but even without it, the color really does look fantastic! Just found your blog- it is darling! I am your newest follower and would love to have you check out my blog and follow back if you want! Really nice color! Thanks so much for linking this up to our Wicked Awesome Wednesday party! Great transformation!! I love turquoise color! It definitely looks like the more expensive version. She Shoots, She Scores...........Love It !!! Looks like the same thing~good job! Love the shade ... why not get a white shade and then you have the option to "switch" back and forth. Love the color!! Love the color and the makeover! Thank you so much for linking this up as well! I LOVE the color!! Looks awesome. I hope you will share at my party! Everything about that lamp is perfect! Great job! what is the name of the color of that lamp and the brand? I have been looking for that blue for a project I have. I love this awesome Z Gallerie knock off! Thank you so much for linking up last week at Sew Woodsy! We look forward to your future contributions to our weekly link party! Do you happen to remember the name of the color you used? Love that color! Do you remember the name of it? I've just read through a bunch of your old posts and loved them all! Definitely a new follower! Also, if you're a "no-reply" blogger, I can't answer your questions directly! Wow I love the lamp and it's lamp shade. 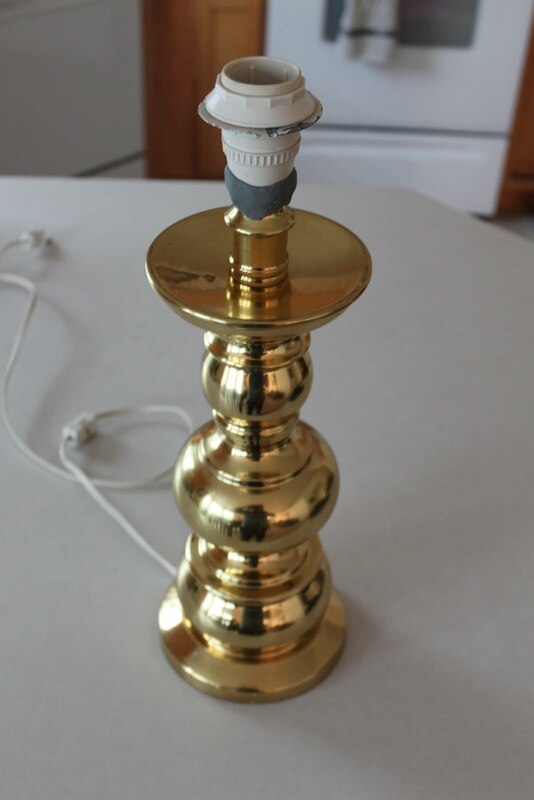 In a million years I would have not thought to paint a brass lamp. That is an awesome idea. Love that you painted a brass lamp! Thanks for the IDEAS! I personally love the shade. Love the blue colour! And I would keep the shade! I like it! Thank you so much for being a part of Tales from Bloggeritaville’s Thrifty Thursday! 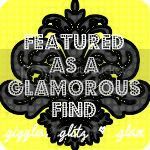 I just LOVED your project and am featuring it in my Friday Flashback! I sincerely appreciate you linking up. It’s not a party without guest! Thank you! I love the new color! Thanks for linking up to Craft and Tell this week! 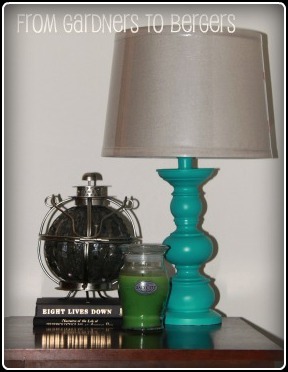 I am loving all your links : ) But this lamp is so much fun! This is one of my favorite colors! AMAZING knockoff! I just love it - definitely keep the shade, it looks beautiful with the newly painted base. 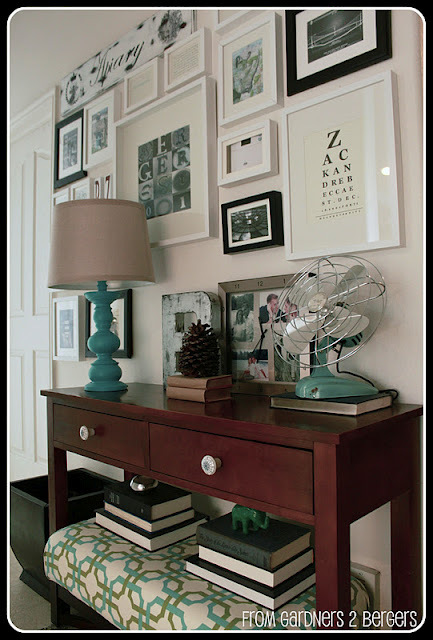 In LOVE with what you did with that lamp!! Becca, I love it when you see something and then replicate it. It is hard to explain the feeling, but it is wonderful! Love your lamp. It just turned out amazing. Keep going girl! I am in LOVE with the color that you painted it. 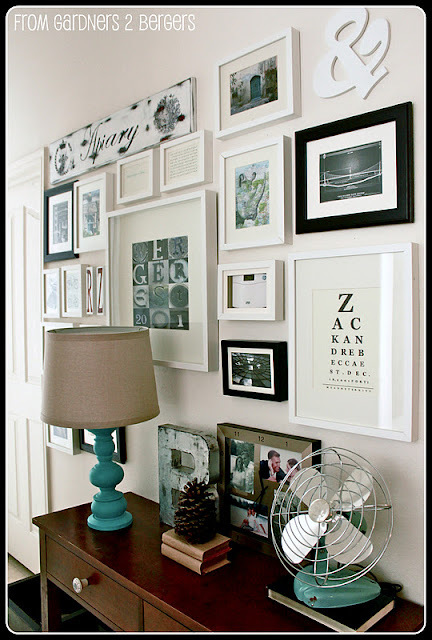 LOve your blog and your decorating style too. New follower. 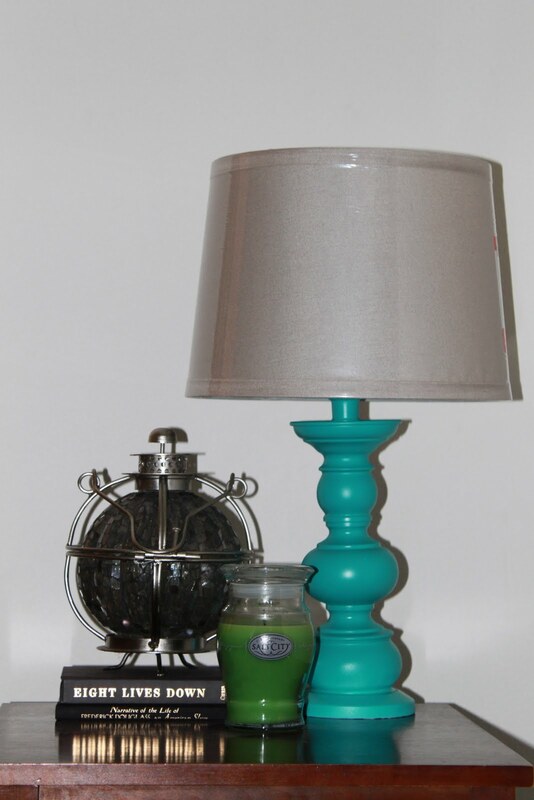 The lamp is way cool, Becca, and a great color! I have two old & heavy brass lamps in my garage (for years, I must admit). Time after time I've thought of painting them, but just never have gotten around to it. Now I'm inspired! Thanks for sharing your project at Potpourri Friday! That lamp does have a good shape...no a great shape! And then you picked a GORGEOUS color too! It looks perfect! I love the shape of this lamp! It's amazing how much spray paint can change anything! Great knock off. Nice price too. OMG!! I love it. awesome price. I would love it if you linked it up my new link party. Amazing turnout! Thanks for sharing at Create & Inspire! Oh I love it! It does look amazing! I would love for you to link it up at our party! tee- hee :) I searched for Z Gallerie on pinterest because a friend and I are going to have a little knockoff- party inspired by said outlet soon. Your post was the first that really stood out- LOVE it!